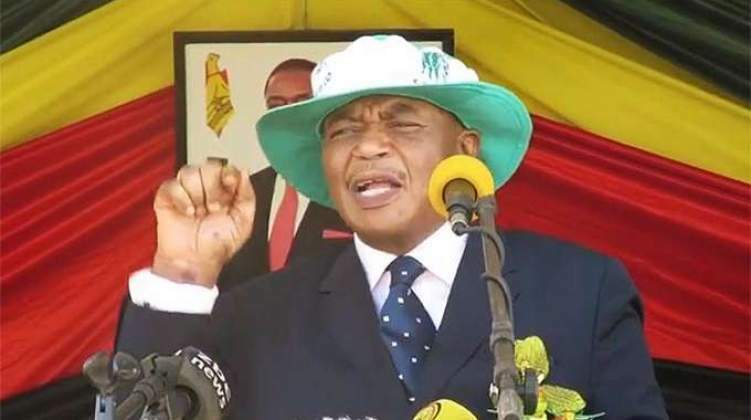 Acting President Retired General Dr Constantino Chiwenga says panic buying and hoarding tendencies are fuelling shortages and price distortions. Dr Chiwenga was speaking at the launch of the second phase of the centre pivots irrigation facility under the crop production programme, held at Farnley farm in Chegutu East constituency today. The Acting President launched the second phase of the centre pivot irrigation facility at a time the country is experiencing unpredictable rainfall patterns that are inconsistent with the traditional farming season. The irrigation facility will thus mitigate the impact of mid season droughts and El niño effects that Zimbabwe is subjected to. After a brief tour of the farm, Chiwenga who was accompanied by Acting Chief Secretary Mr George Charamba, proceeded to address hundreds of Zanu-PF supporters from surrounding areas, cabinet ministers, government officials and captains of industry who converged at Farnley farm to witness the launch. "Let's build our nation and let's desist from promoting tendencies like panic buying or using social media platforms to spread misleading information," he said. Forex is in high demand with various sectors sharing the little that the country is generating, noted Dr Chiwenga while imploring Zimbabweans to develop a culture of pulling in one direction to achieve set goals. Turning to agriculture, the Acting President said the country needs farmers with a business perspective and beneficiaries of the irrigation facility will be subjected to an approved selection criterion. The irrigation facility programme is a public-private-partnership arrangement between the government and a company called Pedstock Investments. Other speakers at the launch included Lands, Agriculture, Water, Climate and Rural Resettlement Minister Retired Air Chief Marshal Perrance Shiri, Minister of State for Mashonaland West Mary Mliswa, Pedstock Investments Managing Director Mr Dror Jackson, house of assembly member for Chegutu East Webster Shamhu and owner of the farm Mr Ngoni Chirikure. To date twenty by forty (20*40) hectares centre pivots have been delivered into the country while a further 20 kilometres of pipes for irrigation have been secured.